Before we talk about the game, let’s mention the USO. As it happens, I spend a good bit of time lending a hand at the USO lounge at RDU. There I have the privilege and opportunity to spend some time with the men and women (and their families) serving our country these days. As you must know, North Carolina is home to three of the major military installations in the country — Camp LeJeune, Fort Bragg, and Seymour-Johnson — so we have plenty of traffic at the USO (and at the one at Charlotte’s airport). Volunteering there gives me a chance to stay in touch with these young people and let me tell you they are just great. You’d be proud to know them. 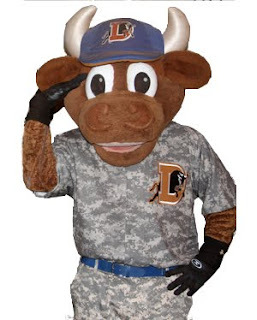 Anyhow, you can bid on a cool jersey worn by a Bull this 4th of July. And the USO gets the proceeds. How neat is that? Your suggestion that this Louisville team might be better than their record becomes painfully, obviously true. I could go on, but you get the point. For a deeper meditation on the meaning of it all, especially the youthfulness of the Louisville team, there’s the Indy Week link. In the meantime we get to take on Gwinnett tonight. They are on a run, having won six in a row. We should do what we can to change that. Since you mentioned the USO, I have a question for the folks here with a military background (which I don't have). Does it bother any of you that the Bulls had Sargent Slaughter at the game for military appreciation night? It always seems to me that he made his career as an overblown character that doesn't represent the actual military members out there. Just doesn't seem like the respectful way for the team to do things. That said, I have never served in the military and if those who have say they aren't bothered by it, their opinion matters more than mine here. Speaking only for myself, he's something of a cartoon, so not worth thinking about too much. On the other hand, you will note that I photoshopped him out of the Wool E. Bull image. That said — I know he's not real, does everyone else? After all you'd be surprised at the arguments you get into when you say that wrestling is fake. So, it's fair to conclude that at a minimum the readers of this site would prefer to not see that annoying Sgt Slaughter clip when the Bulls are losing in the bottom of the 9th? I'll send an email to the front office. Glad to know that I am not the only one that feels that way. I was always hesitant to say anything. Since I am not a military person I was never sure if there was something I didn't know or how much it was my place to be offended by such things. You can definitely include my opinion, if nothing else, on that email. I am not sure how I missed that article, though, Adam. I always enjoy your Indy reviews. Yes, include my vote too to get rid of anything related to the annoying Sgt. Slaughter! Oh, and that silly "cheese on the burgers" game too.